This is the first in a series of colouring books called Magical Mosaics. This book contains 25 colouring pages, and each is a mosaic with hidden objects. The book is available as both a paper book and a downloadable ebook. Scroll down to see an example. It is also available from many other online booksellers (but not Indigo). If you would like to order my book in quantity for re-selling, please email me at gcrabe@mac.com for details. Here is an example of one of the mosaics in the book. 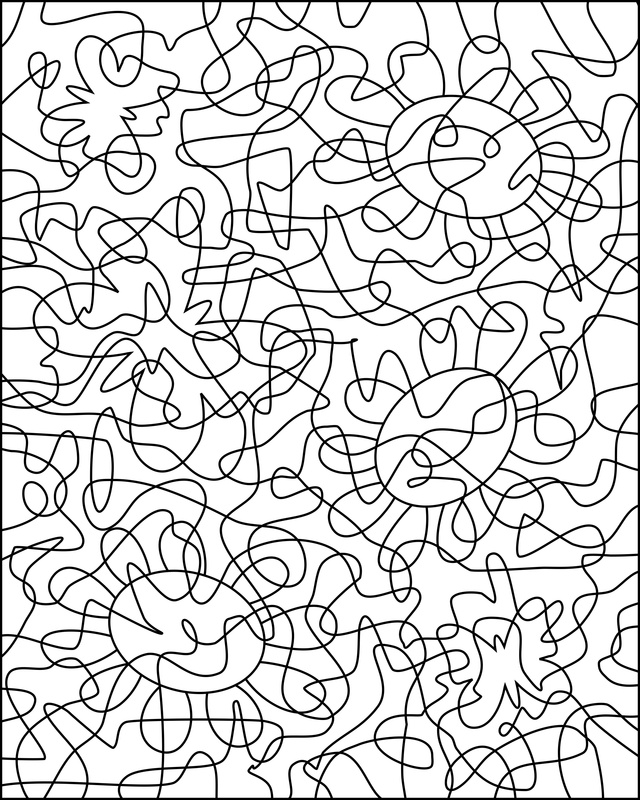 This is the colouring page as it appears in the book. Click the image to see the full size, and to download it for yourself. The mosaic contains hidden objects, in this case, three flowers and three butterflies. Here, I have coloured the mosaic pieces that are inside the objects. Then, I use a different colour scheme for the background pieces. If you have trouble finding the images in the mosaic, you will find a solution like this at the back of the book.